Marcus Law knows Kettering Town need a good result against Redditch United tomorrow (Tuesday) night to keep themselves in the “early mix” in the Evo-Stik Southern League Premier Division. The Poppies head into the clash, which will be played at Bedworth United’s home ground on a 3G surface while work is carried out at Redditch’s Valley Stadium, on the back of a win, a loss and a draw from their opening three matches. They were held to a 0-0 draw by Hitchin Town at Latimer Park on Saturday in a match that saw both teams finish with 10 men as Rene Howe saw red for Kettering. The clash with Redditch represents another tough test against one of last season’s play-off semi-finalists, who have started this season with two wins from three matches although they suffered a last-gasp defeat at Weymouth on Saturday. And Law concedes his team have work to do ahead of the first two successive away matches. 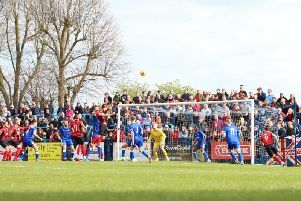 “It’s on the plastic pitch and obviously they (Redditch) wouldn’t have played on that sort of surface this season like we haven’t, it makes it a strange one,” the Poppies boss said. “But they have had a better start than us and it has taken a 90th-minute penalty to beat them at the weekend. “They will be in a positive frame of mind and, from our point of view, we need to go up there and ensure we get a result to keep us in the early mix. “It’s the first month and we knew we had been given some tough matches at the start of the season.